Phil Waugh is an Australian rugby union player who’s career as a player began at the Shore School, Captaining the school’s team in 1997. After his performance in this team, he was asked to represent Australia in the 1997 Schoolboy’s Team. 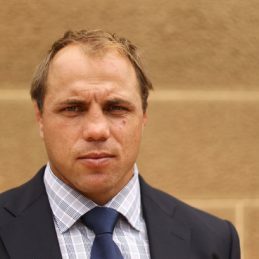 Phil’s rise through the ranks continued in 1998, when he was was named in the Australian under 19’s Rugby team, and subsequently the under 21’s 1999 to 2000. Phil’s professional career began in 2000, where he was named in the Wallabies test squad, and was played as a replacement in a match against England. Phil continued receiving game time with the team until early 2002, when an ankle injury caused him to miss out on the international season. After his recovery, Phil returned to the field to be named Vice Captain of the 2003 Rugby World Cup team, who were ultimately runners-up. He was rewarded for his performance in 2003 by winning the John Eales Medal for the Wallabies Best and Fairest Player, and was regarded by many experts as Australia’s best loose forward. The Waratahs captain in Super rugby, Phil was a constant member of the Wallaby match-day squad. The 29-year-old, who became the 74th player to captain the Wallabies when he led against Wales in 2006, and was in charge twice more in 2007 against Wales and Fiji; returned to the Wallabies in 2008 fresh leading the Waratahs to their second Super rugby final in four seasons. Phil is an inspirational leader and speaker on both Rugby and life.